Me, my sister and Beatrix were standing in a room of a big old wooden house looking at a green corpse of a lady in an open coffin. Another lady, this one alive, was standing next to us with a kind smile on her face. She was the daughter of the dead lady and she invited us to her house to say hi to her mother, who’d been dead for 6 months. 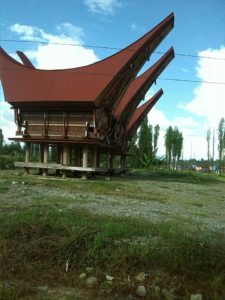 This was in Tana Tora ja on Sulawesi island in western Indonesia where they treat their deceased loved ones very differently to the rest of the world. For a funeral to happen they need to kill water buffaloes. Sometimes they kill 3-4 but at other times, when the person who died was rich, they’d kill up to 100 buffaloes. 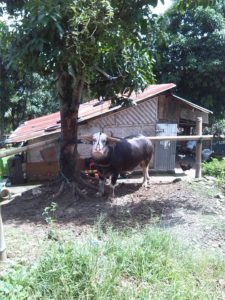 The families don’t have water buffaloes readily available to kill when someone dies, so they have to save up money to buy them. They start saving when a family member dies and it might take them a few years to gather enough money if they want to properly honour their loved one with a good number of sacrificed water buffaloes. 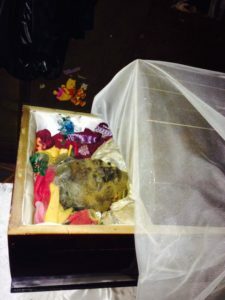 During this time the dead person stays with them in the house (in a separate room usually). They embalm them so they don’t smell, give them food three times a day and talk to them as if they were alive. They don’t think of them as dead until the first water buffalo gets killed for them. Before that they are only sick. I kind of like this approach, except for the water buffaloes they kill, because they have time to adjust to the thought and say good bye when someone they loved dies, it’s not so sudden as it is for us. The funerals were also very special and they were actually a tourist attraction. Of course we went to one. You can read about it here! 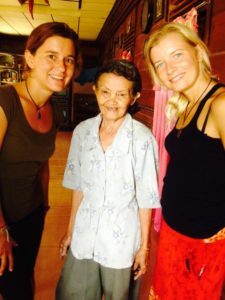 Beatrix lived in Tana Toraja and we were staying at her house through Couch Surfing. This kind lady was her friend and that was how we ended up at her house saying hi to her mother. They consider it a big honour when someone from far away comes to their house to visit, so she was happy to welcome us. she even let us take a picture of her mother. Beatrix and her family were very modern and they didn’t practise the village’s customs but they liked hosting westerners and show them around explaining the traditions of the area. She worked in a laboratory. She and her husband had one daughter, who was about 4 years old then. We didn’t get to meet him because he was away on a business trip just then. They had a full time nanny who lived there with her 3 year old son and took care of the household. 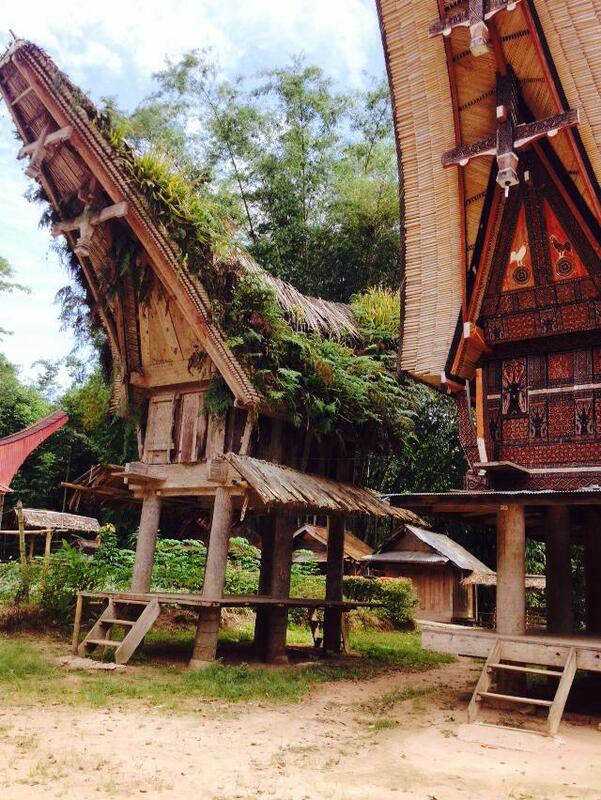 The traditional houses in Tana Toraja had a boat shaped roof. But Beatrix and her family lived in a big modern house with lots of rooms and a big kitchen and both Beatrix and the nanny were very welcoming. One day Beatrix gave us some local specialty to eat. It was rice with some meat and hot sauce. We loved the meal but both me and my sister were sick an hour after eating it. We kept it quiet from Beatrix as we didn’t want to offend her. 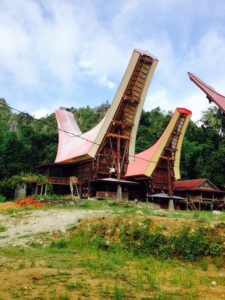 There were other things that were special about Tana Toraja, they eat everything from barbecued rats and dogs to bats and they have gruesome meat markets where all these animals are for sale, some dead and others alive. You can read about those markets here! Their funerals are a tourist attraction and you can pay an agency to take you to a funeral. You can read about the funeral we went to here!